An African-American mural in Los Angeles has been vandalized with swastikas in an act the Los Angeles Police Department said it's treating as a hate crime. 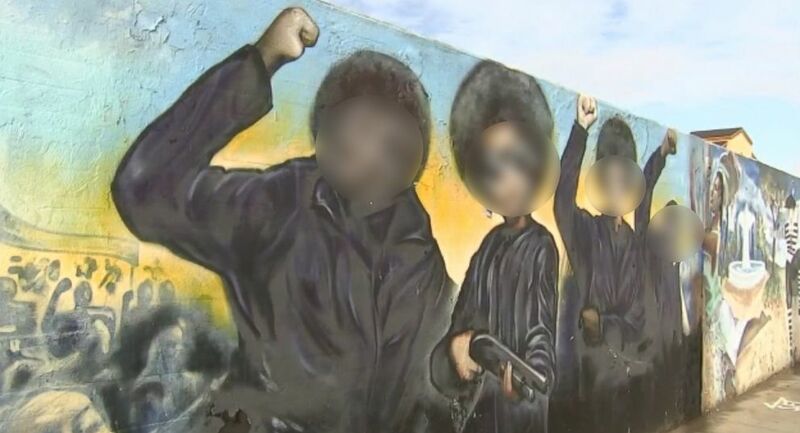 The white swastikas were painted over the faces of four female figures from the Black Panther movement, part of the "Our Mighty Contribution" mural in the city's Crenshaw District. The vandalism was reported Thursday, said LAPD spokesman Josh Rubenstein. "We are currently asking the public for any information they may have about the incident," Rubenstein told ABC News Friday via email. "If anyone does have information they are encouraged to call Southwest Detectives." (KABC) A mural depicting influential African American figures was vandalized with swastikas in the Crenshaw neighborhood of Los Angeles, Nov, 29, 2018. Besides Black Panthers, "Our Mighty Contribution" depicts other African-American icons through history, from including Martin Luther King Jr. to Louis Armstrong to Harriet Tubman, political consultant Jasmyne Cannick told ABC News. "In 2002 a group of about 12 artists got together and painted what is there now," she said. "The wall in the community is pretty well known. It's been featured in a lot of music videos, a lot of movies," she said, and it's "always been sort of an unwritten rule with taggers and gang members that that wall is hands off." "In a city that gets tagged on a regular basis, it's amazing that all of these years, for the most part, it has not been bothered," Cannick said. One of mural's artists has cleaned off the swastikas, Cannick said. "I really want this investigated. I really think the community deserves to know who did this," she said. "For a police department that prides itself on solving cases from 50 and 60 years ago, this should be pretty easy to crack." News of the vandalism comes one week after another alleged hate crime in the city. On Nov. 23 a driver allegedly spewed "hateful remarks regarding Jewish heritage" at two Jewish men after they left their synagogue, according to Los Angeles police. The driver then allegedly tried to plow into them on the street, police said. The men were not hurt and the suspect was taken into custody. "Hate in America is on the rise," Los Angeles Police Department Chief Michael Moore told reporters Monday as he announced the suspected driver's arrest. "That has to change," Moore said.